Held in New York City, the pavement outside the reception became a veritable runway of fashion's finest, all dressed in their best looks. Notable names include (deep breath) Kate Moss and her daughter Lila, the Hadid sisters, Naomi Campbell, Kaia Gerber, Emily Ratajkowski, Anna Wintour, Rita Ora and Rachel Zoe, amongst many others. Being such a high-profile fashion wedding, the outfits, naturally, did not disappoint. Highlights include Christina Ricci's pale blue Batsheva prairie dress, Kaia's '80s power suit and the Moss mother and daughter duo's gold and maroon getups. Time to take notes for your next summer 'do. Scroll down to see our roundup of outfits from 2019's most stylish wedding. 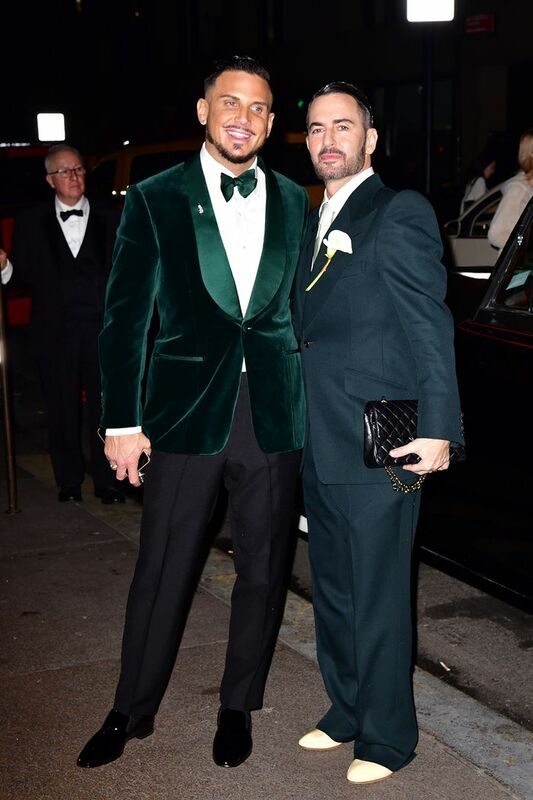 Style Notes: Marc Jacobs looked suitably dapper in a navy suit and lily buttonhole, while his partner, Charly, stood out in a forest green velvet tux and bow-tie. Style Notes: Kaia channelled some of her mother's '80s spirit with a greige power suit and strappy sandals. Style Notes: Trust Naomi Campbell to make a bedazzled cape look so easy to wear. We love the mesh polka-dot cutouts, too. Style Notes: The Hadid sisters are our forever #styletwinning muses. We might just copy them and wear trouser suits for our next wedding. Style Notes: Mother-daughter dressing doesn't get much better than this. Kate looked so elegant in her maroon column dress, while Lila embodies the party spirit in a gilded mini. Style Notes: A LBD is never a bad idea at a fashion wedding—especially when it's worn by Chloë Sevigny. Style Notes: Emily Ratajkowski embraces one of our favourite wedding guest dress trends for this season with a dramatic satin midi dress. Style Notes: Never seen without her signature bob and sunnies, Anna Wintour looks very on trend with a long-sleeved floral maxi dress. Style Notes: Okay, this is our dream wedding guest dress. Christina Ricci looks to brand on the rise Batsheva for this pale blue getup, which we imagine would look just as cool dressed down with sneakers. Style Notes: As always, Rita Ora isn't afraid of a bold look, and this theatrical gown wouldn't look amiss on a red carpet. Style Notes: Another look we would happily steal. The balloon sleeves and high neckline offer this sea-green gown a satisfyingly retro feel.